Woman in Gold is a hybrid legal-historical drama concerning itself with the Portrait of Adele Bloch-Bauer I, a painting by the Austrian artist Gustav Klimt. The painting was confiscated from the Bloch-Bauer family during the Nazi occupation, and the film details the story of Maria Altmann née Bloch (Helen Mirren) trying to reclaim it from the Austrian government in the late 1990s. She gets the help of Randol Schoenberg (Ryan Reynolds), a family friend and lawyer, as well as Austrian journalist and radical Hubertus Czernin (Daniel Brühl). The film is interspersed with flashbacks about Maria’s last days in Austria in the wake of the Nazi occupation. While legal proceedings and repartee have a precedent of being compelling on screen, it is not a surefire way to ensure drama. Woman in Gold satisfies that criteria, aided by the real-life events being as unpredictable as any twisting fictional narrative. Smartly, the film rarely finds itself in an actual courtroom, and focuses its attention on the cleverness of Schoenberg in overcoming legal obstacles as well as Maria’s connection to the Austria of her youth. The only major flaw in the film is the sheer amount of flashbacks. While I appreciate the filmmaking impulse to indulge in period costumes as well as the dramatic imagery associated with the Nazi takeover of Austria, the flashbacks themselves have little momentum. There are certainly a few key moments, specifically her wedding and departure, that enhance our understanding of Maria’s reluctance to return and all around conflicted feelings pertaining to her home country. The quality of the flashbacks themselves are bolstered by Tatiana Maslany’s performance as the younger version of Maria, who brings a resilience to the role. 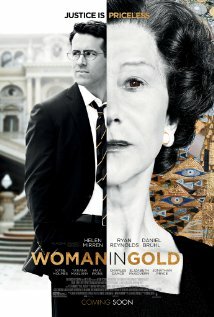 Released at any other time of year, many would dismiss Woman in Gold as “Oscar bait,” and while it does have a look that is slick yet unremarkable, the film succeeds because it understands its characters, their motivations, and how they respond to the obstacles before them. Creating the link between Schoenberg and his own past is just as powerful as Maria’s recollections, and helps the film to cross a generational gap. How we are connected to history is something we feel in our everyday lives, even if it isn’t always present on our minds. How we got to our own lives is largely dependent on decisions made decades (or more) in the past. 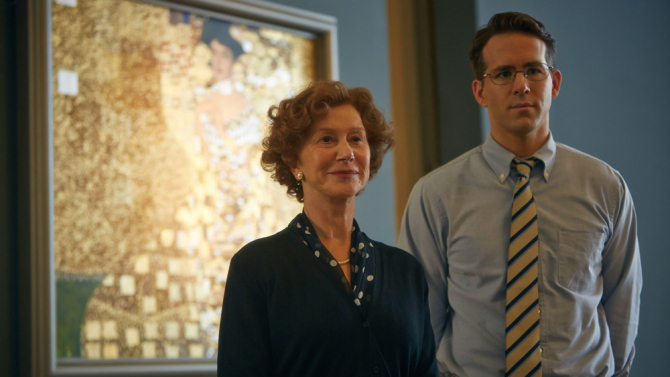 While not overly stylish, Woman in Gold is well-acted, delivering on the promise of showing the deep emotional toll playing into even the most abstract of legal concepts. Woman in Gold is a film that wears its heart on its sleeve, and while that may turn off some, I found its earnestness inoffensive as I was too swept in the story to be bothered by it. While the film’s look, courtesy of My Week With Marilyn director Simon Curtis, is as bland as can be, it mostly refrains from being a net negative. Woman in Gold captivatingly dramatizes an unbelievable story, and one that has commonalities with many others, giving it weight and significance, asking us to reconcile our history with our present. Woman in Gold opens in Philly area theaters today.